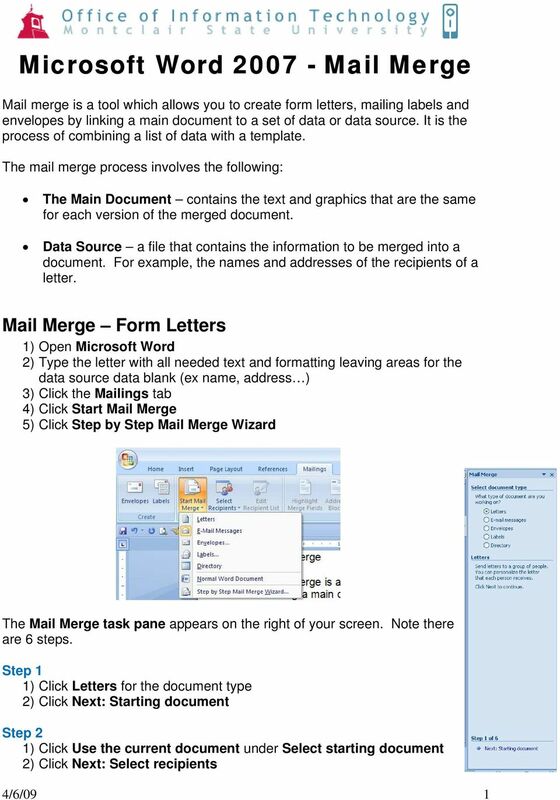 Download "Microsoft Word 2007 - Mail Merge"
Six Steps to Completing a Mail-Merge Mail merging means to plug data from an address table into form letters, e-mail messages, envelopes, address labels, or a directory (a list or catalog, for example). 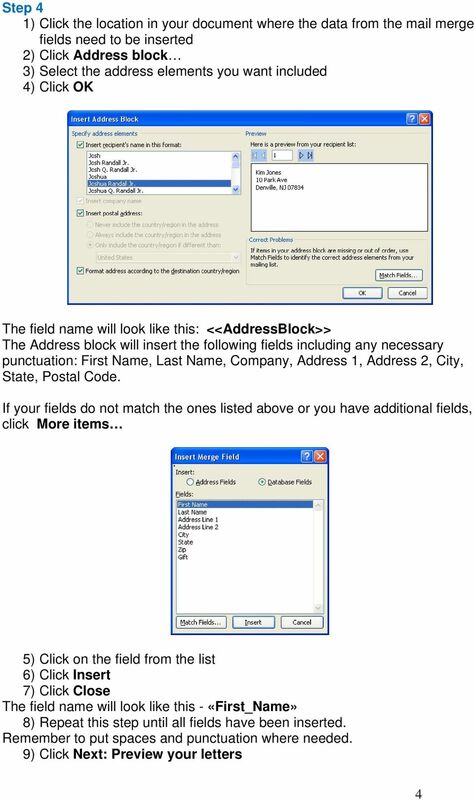 IT Quick Reference Guides Performing Mail Merges in Word 2010 Word Guides Mail merges are useful when you want to create form letters or other documents sent to or drawing information from multiple customers. The first thing to do is choose if you are creating a mail merge for printing or an e-mail merge for distribution over e-mail. 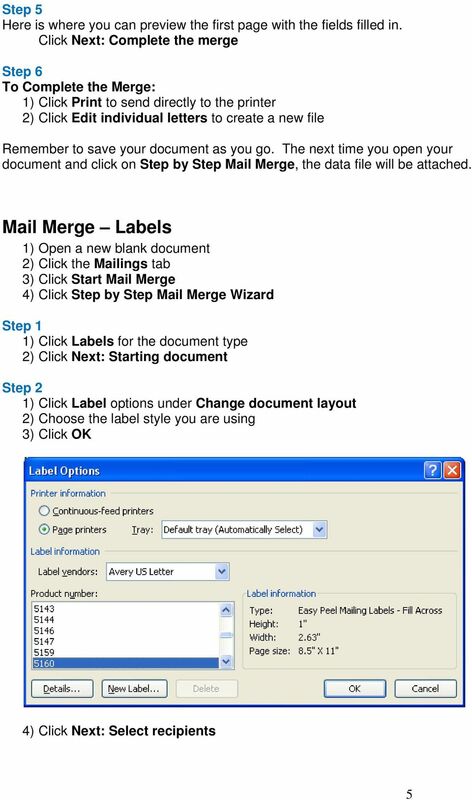 Mail Merge: Create Labels and Envelopes, Oh My! CREATING A MAIL MERGE CREATING A MAIL MERGE DOCUMENT. 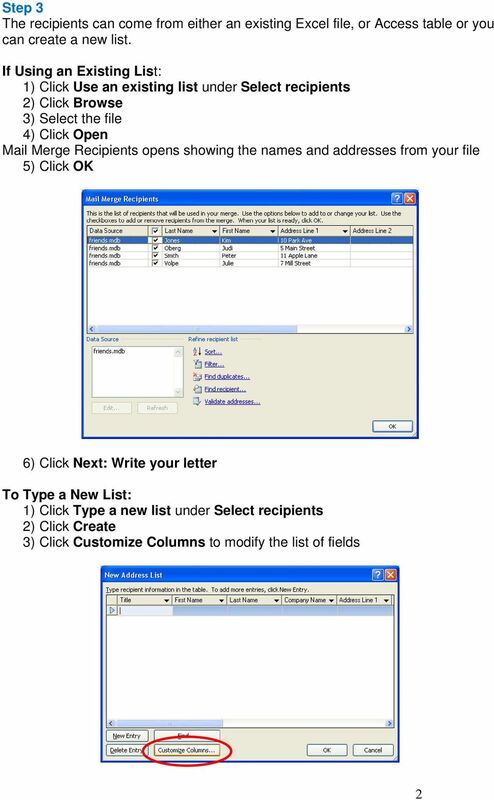 Creating a Mail Merge Complete the following steps to create a Mail Merge. Word 2013 Tip sheet Word window Quick Access Toolbar Commands here are always visible. Rightclick a command to add it here. Ribbon tabs Click any tab on the ribbon to display its buttons and commands. Sample- for evaluation purposes only! Advanced Word. TeachUcomp, Inc. A Presentation of TeachUcomp Incorporated. Copyright TeachUcomp, Inc. In different versions of Word there are variations in the way Mail Merges are done, though the general concepts are the same in older versions. Information used to create labels in the Client Data System (CDS) can be exported out of CDS and used to create labels in Microsoft Word, making it possible to customize the font style, size, and color. The files you will need are located on the class website in the IWEA directory/folder.